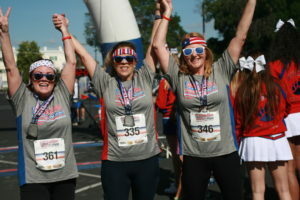 Join us for the Clovis Memorial Run to be held May 25, 2019. The event is to honor and support our senior citizens, veterans and active military on Memorial Weekend. We hope you will join us to Honor our Legacy of the senior citizens and veterans in our community. The event is for all athletic abilities and ages and will be held rain or shine. The event includes a timed 5K (3.1 miles) run or walk, a non-timed 2-mile walk, a non-timed 1/2 mile kid’s run, and a non-timed 1/2 mile Senior Walk & Roll. Your registration includes a t-shirt, pancake breakfast ticket, goodie bag, one raffle ticket (additional tickets available for $1.00) and a participant ribbon. The 5K or 2-mile registration is $35 until May 11. The Kid’s Run or Senior Walk and Roll is $25 until May 11. Veterans and active military may participate for free but must register by May 11 in order to get their shirt and other goodies. Veterans and active military who register after May 11 are $10. Early bird registration is available through May 11. No mail in registrations after May 18 – in person at the Senior Center or on-line only. From May 12-25 the cost per runner increases $5.00 per person for each event listed above except for active military and veterans which changes from free to $10. Shirt sizes and quantities are not guaranteed for registrations after May 11, 2019. Online registration is available until May 21. Proceeds from the event go to the Clovis Senior Activity Center to help improve our programs. In conjunction with the races, a resource fair will be held in the parking lot adjacent to the Senior Center. Vendors and information for seniors, veterans and their families will be available. A pancake breakfast will be served inside the Clovis Senior Center. Each participant will receive a breakfast ticket and additional tickets for family and friends can be purchased for $5.00 each. Some additional shirts (they’re nice ones!) are available for $10.00 each ($12.00 for 2XL). Packet and shirt pick up is available at the Clovis Senior Activity Center located at 850 Fourth Street in Clovis on May 23 and 24 from 9:00 a.m. to 6:00 p.m. and the day of the event, May 25 starting at 7:00 a.m. The kid’s race starts at 7:30 a.m., followed by the Senior Walk and Roll at 7:40 a.m. and both are not-timed. The 5K is timed and starts at 7:55 a.m. and the 2-mile-walk at 8:00 a.m. The resource fair will be open from 7:30 a.m. to 10:30 a.m. and the pancake breakfast will be served from 8:15 a.m. to 10:30 a.m.